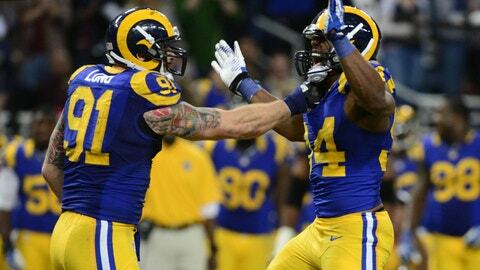 Robert Quinn celebrates with teammate Chris Long, who carried the dominant defensive end off the field after the game. Quinn's three sacks gave him 18 for the season -- a team record and first in the NFL. ST. LOUIS — Donald Penn shook his head. "I’m disappointed, man," the Tampa Bay Buccaneers’ left tackle said. "This has been a rough year for me, up and down. I’ve been fighting and fighting and then today …." Penn shook his head again. "I really went into this game today thinking I was going to really have a dominant performance," he continued. "It started off great for three quarters. Then the end is just …." He’s going against two or three guys at one point in time and he’s still winning. He’s special. We don’t run across people like that. Not since I’ve been in the NFL. I haven’t seen nobody close to him. "I have to figure out how to do something when I know the chip’s going," he said. "I have to figure out to stay inside-out so when he does get knocked inside I can run by him, because a couple times he got knocked right into Mike (Glennon) when Mike was stepping up. He’s a good player. You can’t take that from him. It’s tough. That ain’t me out there. It’s just real frustrating. I let the team down today." Robert Quinn struck again in the Rams’ 23-13 win against the Buccaneers on Sunday at the Edward Jones Dome, adding another batch of highlights to help make his case for the NFL’s Defensive Player of the Year award. The Rams’ defensive end wreaked havoc on the Buccaneers’ offense, running around and through Tampa Bay’s left tackle and whatever double- or triple-team the Bucs threw at him. Quinn couldn’t be stopped. He still sacked Tampa Bay quarterback Mike Glennon three times — including a pair to end the Bucs’ final two possessions — giving him a team-record 18 on the season as the Rams turned in another dominating defensive effort in front of a crowd of 54,423. "I had a good game plan going in there and we executed early," Penn said. "Late he adjusted and I didn’t. It got bad and ugly." "We don’t just carry anybody off the field," Long said. "We don’t just carry any jack-wagon off the field. This guy’s like … this guy’s something else." "Talk bad about me, Chris," he said.